No matter which way the market turns, you can depend on RCS to help keep you on course. Since 1981, our retail clients have depended on our extensive expertise to restructure, optimize, manage, and grow their real estate portfolios while also identifying cost-saving opportunities. Contact us to meet at RECon and learn how we can help you stay on track! RCS President and CEO Ivan L. Friedman speaks to Evergreen Partners about the current state of the retail real estate market and provides tips for retailers. Ivan Friedman spoke with Mike Lake, SVP of Marketing for Evergreen-Partners, regarding the state of retail real estate and some of the challenges companies are experiencing as their real estate footprint evolves with the times. He answered questions pertaining to the different ways retailers are going about working with landlords to make modifications to their leases. To read more, including advice Ivan has for retailers, click here. PacSun – This leading specialty retailer of branded and proprietary casual apparel, accessories, and footwear designed to appeal to teens and young adults operated 593 retail stores in 50 states when it filed for Chapter 11 bankruptcy protection on April 7, 2016. 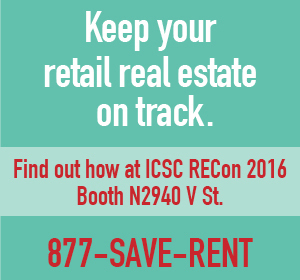 RCS was retained as PacSun’s real estate advisor to reduce the occupancy costs at their on-going locations. Vestis Retail Group – RCS was engaged as the real estate consultant for the parent company of Eastern Mountain Sports, a seller of outdoor gear, and Bob’s Stores, a seller of discount footwear and clothing, when they filed for bankruptcy on April 11, 2016. RCS was retained to market any leases retaining value and to reduce occupancy costs at the remaining locations. With the courts approval, the company plans to emerge from bankruptcy with 53 Eastern Mountain locations and 35 Bob's Stores. Aéropostale – This mall-based specialty retailer of casual apparel has retained RCS to act as their real estate consultant to help them develop negotiating strategies as they seek to restructure through a Chapter 11 bankruptcy process. The company operated more than 700 Aéropostale stores in the United States, Puerto Rico, and Canada, and 25 P.S. from Aéropostale stores in the United States when it filed for Chapter 11 bankruptcy protection on May 4, 2016. Brookstone – RCS has been retained to operate as the outsourced real estate department for this retailer of innovative lifestyle products designed for smart living. Founded in 1965, Brookstone offers a diverse collection of exclusive, uniquely designed, high-quality products through a multi-channel strategy including over 300 shopping mall and airport stores across the U.S. and Puerto Rico. We greatly appreciate all of the efforts of RCS Real Estate Advisors to help us close down the retail stores of Juicy Couture (when we were still known as Fifth & Pacific Companies, Inc.). RCS was diligent in its efforts to obtain cost-effective terminations to these leases in as timely a manner as possible. We greatly appreciate the work and partnership of RCS. RCS congratulates client Diamond Wireless for their hard work in completing over 45 projects in the last 3 years! Diamond Wireless has been very focused on maximizing their footprint throughout the country. The addition of 160 B.J's Wholesale Club locations has given them the important operational infrastructure needed to penetrate new markets in the Northeast, Southeast, and Mid-Atlantic areas. RCS has facilitated the conversion of 27 kiosk to inline conversions for Diamond Wireless over the last 3 years which has significantly increased their footprint. In 2015, Diamond Wireless opened 16 new locations and completed 4 relocations. For more information, please contact Moe Puri, Vice President.